Information to be inserted, laid out, formatted and arranged for maximum readability with relative ease. In short, if you are engaged in budgeting, it is essential to use spreadsheet software and Microsoft Excel is the best known. Get access to video tutorials that assist you learn many of the important techniques in developing Excel worksheets for a budget. In reality the process is not as hard as it might seem at first. Initially, your workings might have only scant information and only very basic design and formatting. But with a series of daily small adjustments and embellishments, it does not take long before your Excel worksheets begin to look impressive. It is really important to grasp the technique of building multiple worksheets at the outset. It will be likely that your budget workbook will need 15 or more worksheets. Each worksheet is devoted to a separate income or expenditure item in the budget. Some worksheets will indeed be simple and small, but others could be quite significant masterpieces in their own right. It is an excellent feature of Microsoft Excel that it allows the user to create an almost limitless number of worksheets. 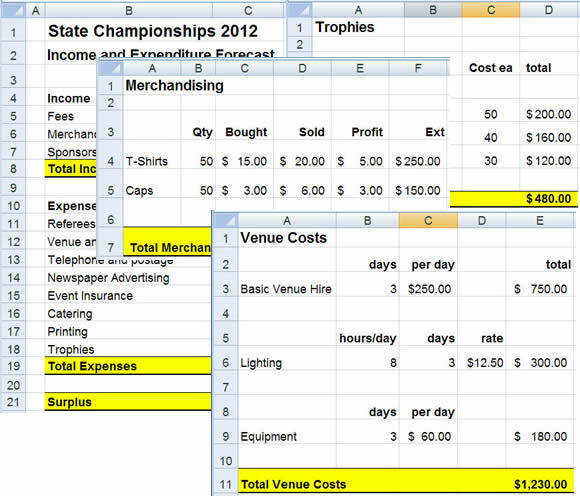 See an example budget with multiple worksheets. By creating a separate worksheet for each item in the budget it becomes comparatively easy to deal with formatting. Thus each sheet can be published as if it were a page in the book, nicely formatted and easy to read. Although there is some initial learning, spreadsheet users can prepare a budget workbook much more quickly than can be produced by working with pencil and paper alone. The amount of technical know-how needed to created a simple spreadsheet is really not that much. A "Summary" worksheet will be required to pull together the final totals from all the other worksheets . The Summary Worksheet therefore becomes the complete income and expenditure statement. An outstanding feature of Excel spreadsheets is that the summary sheet can be linked to all the other worksheets in the budget. Therefore any changes to the worksheets is automatically reflected on the summary sheet. This not only saves time but also reduces the likelihood of error. Linking figures on the summary sheet to all the respective worksheets is a simple process. On the summary sheet in the cell where the total of salaries is to appear, type an equal sign i.e. type "=". Then, point with your mouse to worksheet containing the answer and the cell where the answer can be found. Then hit the ENTER key. This creates a link.